Whether organising a big party or an intimate get-together, there’s always the worry that you’ll forget something. Our party planning countdown should help to put your mind at ease and ensure everything runs like clockwork. WaitroseEntertaining is our made-to-order food service with more than 250 irresistible products to help you relax and enjoy hosting parties and gatherings. You can order online and put together a menu where you cook a little or not at all, giving you more time to spend with your guests. WaitroseEntertaining offers a fabulous range of more than 100 cakes, to add a focal point to your celebration. Remember, our wedding cakes require at least 35 days notice for delivery, while many of our celebration cakes need to be ordered up to two weeks in advance. All our cakes can be personalised with a special message at the checkout. Personalising a cake can be a thoughtful way to wish someone ‘good luck’, ‘bon voyage’ or ‘happy retirement’! Having extra glasses will save you having to wash up while you’re meant to be hosting. WaitroseEntertaining offers something for every occasion and many of the dishes in our range require just four days notice for delivery or collection in branch. However, it’s best to place your order a couple of weeks in advance – if only to put your own mind at ease. When you order you’ll be able to choose whether you’d rather collect your food in branch or get it delivered to your home for free (subject to a minimum spend of £60). 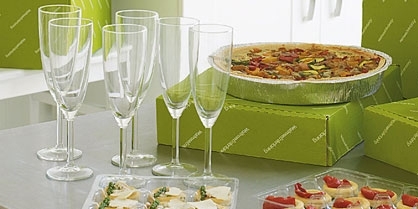 Getting the food delivered on the day of the party can be a great option for busy hosts. Whatever you’re celebrating your guests are bound to appreciate a tipple. Waitrose Cellar offers a comprehensive range of red wine, rosé wine and white wine to suit every menu and budget. If it’s a special occasion you’re celebrating you may also want to take a look at our selection of champagne. At Waitrose we have a number of flower arrangements and bouquets that offer a stunning way to add a little colour to your celebration. All our flowers are delivered free as standard and next day delivery is also available. So why not consider adorning your home with a decorative plant and the table with a sweet-scented centrepiece? No matter how well prepared you are it's easy to find yourself without that must-have item when guests arrive. Don't forget to stock up on essentials like lemons, bin bags, bread, soft drinks and kitchen towels - as well as champagne and canapés! Shop for online groceries at Waitrose: Our prices on branded grocery products are now identical to Tesco's (excluding promotions). Clearing a little space in your fridge and freezer can be great preparation for having people round. Party food and frozen desserts will need to be kept chilled before preparation and serving - and a full fridge can make things tricky. Likewise, guests aren’t likely to relish the thought of room-temperature fizz, rosé wine and white wine, so ensure your fridge is fully stocked well ahead of time. Once everything is ready, make sure you take half an hour to relax and make sure you look more ‘fabulous’ than ‘flustered’. If you have time then take a relaxing bath. But even if you don't have time for a bath, make sure you’re not still wearing your apron when the guests start to arrive!